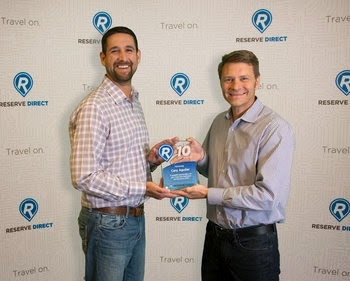 Reserve Direct, a leader in travel reservations and booking solutions for travel suppliers for 13 years, honored Cary Aguilar June 1st for 10 years of service to the company. Cary, Reserve Direct’s Accounting Manager, started with the company in June of 2004 and is the third employee to reach a ten year work anniversary. Cary started as a call center agent for Reserve Direct destinations. During this time he attended Missouri State University in pursuit of a Bachelor of Science in Accounting. In his third year with the company, a position opened in the accounting department of Reserve Direct. Cary quickly filled this position, and upon graduation was promoted as the company’s head Accountant. As Reserve Direct grew to include 10 destinations Cary was responsible for overseeing all product accounts, managing customer transactions and has taken the lead as human resources manager as well. He is vital to both the supplier and customer aspects of Reserve Direct, and has been a true asset to the company. Reserve Direct congratulates Cary on 10 years of dedicated service. Reserve Direct is a travel reservation technology company that focuses on specific travel destinations, offering local expertise and reservations for shows and attractions, as well as hotel reservations to vacationers, families and businesses. The company also offers fulfillment tools to travel suppliers and other regional travel resources. Reserve Direct provides travel service in a variety of markets like Branson, Missouri; Pigeon Forge and Gatlinburg, Tennessee; Orlando, St. Augustine, Panama City Beach and Destin, Florida; Williamsburg, Virginia; Myrtle Beach, South Carolina; San Diego, California and the Hawaiian Islands.